One of the best things about the fall aside from the foliage is football season which means tailgating. Over the years I’ve seen some crazy things at tailgates such as 6 cars going on fire at the Jet’s opening day game in 2016. 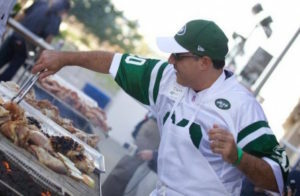 Follow these tips to ensure a safe and fun tailgate. 1. Time it right: Try to arrive about 3 hours before kickoff to get the perfect spot. If you are not tailgating postgame, pack up 30 minutes before kickoff. 2. Invest in real estate: Seek out spaces (or send somebody else to go early) by the grass, edge of the parking lot and close to the bathroom. Fewer neighbors mean fewer issues. 3. Be a tool: Fill a toolbox with your favorite grilling essentials (utensils, zip lock bags, napkins, bottle opener etc). 4. Rethink your drink: We suggest multi-colored cups to identify which is yours as drinks can get nasty. Also use cups with straws to protect from insects. 5. Reduce, reuse, recycle: Cardboard drink carriers make good snack holders. Less is more and makes cleanups easier. 6. Koozie up: Always keep between 5-10 koozies in your car for guests. 7. Freeze it: Putting your water in the freezer the night before equals a giant ice cube which comes in very handy on game day . 8. Dress in layers: There can be huge temperature swings this time of year especially 4p games when the sun goes down in the middle of the game. 9. Keep a duffle bag in your trunk: keep extra clothes, hats, flashlights, batteries, bungee cords and a fire extinguisher can etc. 10. Dump coals in specified bins: Almost all stadiums have specified bins for dumping hot coals. Leaving smoldering coals is hazardous to you and everybody else!